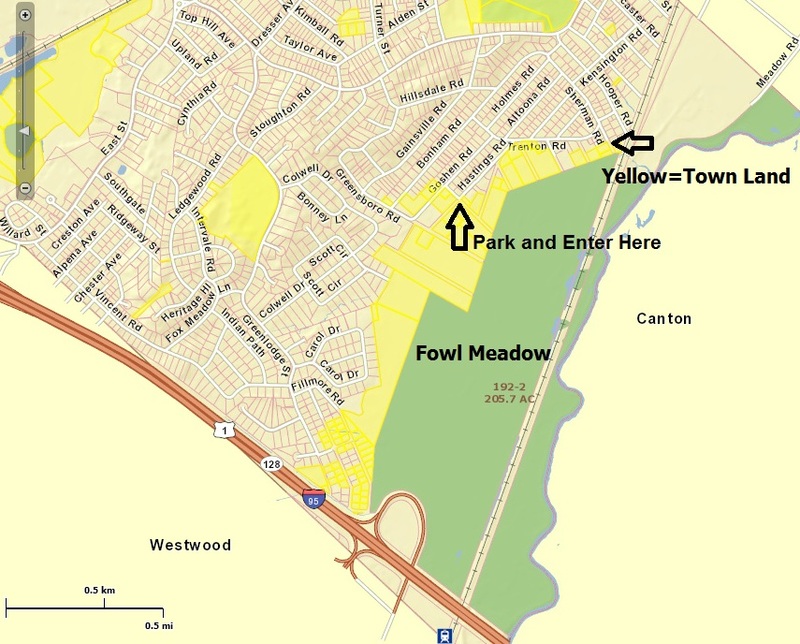 Many people did not know that about 200 acres of Fowl Meadow is in the town of Dedham until almost 100 acres of it burned in April 2012. This beautiful wetlands area is home to many species of plants, insects, reptiles, and amphibians. It is not easy to get into Fowl Meadow, but it is worth the effort. I recommend parking at the corner of Lorain Road and Hastings Road (GPS address 78 Hastings Road, Dedham). Another option is to park near the corner of Goshen and Greensboro Roads, and walk down Goshen (dirt road) then turn right on Lorain. Enter town land at the corner of Lorain and Hastings. This area usually calls for mud boots, but much of it is quite dry now and regular hiking boots may be adequate. I think waders would be overkill. From this entry point, I usually walk south/southwest as if continuing on Hastings Road. Once you are among the grasses and rushes and sedges (oh my! ), look to your right for a few native roses (Rosa palustris, I think) that have somehow survived the infiltration of Rosa multiflora. Keep an eye out for at least one species of boneset (Eupatorium sp.). Next, wander off to your left, into the skunk cabbage and horsetails, and if you look closely, you will find what remains of hundreds of jack-in-the-pulpit flowers and a lot of Nabalus (either albus or trifoliatus). Keep moving south and you’ll find yourself in a wet meadow used as a bedroom by the deer population. There are lots of moths, butterflies, pollinators, and other hopping, jumping, stinging, and biting creatures. You will want to wear long pants, boots (hiking boots or mud boots; waders are probably not necessary at this time), a sun hat, sunscreen, and insect repellent. What you might see: grasses, rushes, sedges, ferns, skunk cabbage, horsetail, boneset, jack-in-the-pulpit, wildflowers, common snowberry, swamp rose, snakes (along Goshen Road), stinging nettles, insects (pollinators, moths, butterflies).